Building a team is part of the growth and development of a business. And as you build your team, with your vision leading the way, growing pains and operational challenges associated with managing people can be road blocks in the way of success. Chances are the initial phases of team building will mean working more and investing resources in others. So understanding how to better manage your team is a critical step. 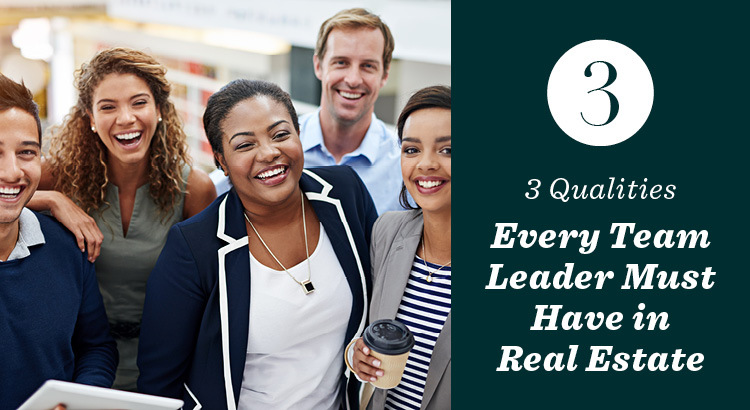 In this blog post, we’ll cover the three key qualities necessary for team leaders to best manage personalities and ensure productivity. If you’re one of those TL;DR types, and you’re going to be leading a team in 2019, then start your seven-day free trial of AgentEDU today to watch the full “How to manage your real estate team” course. To start, think about what you see as the future of your team. As a team leader, your success will come when you can run a business that fulfills your vision. Finding and leading other personalities in line with that vision will make you a successful manager. Shifting your role from agent to team leader can mean making compromises while you work to develop your management style and mindset. This doesn’t mean you have to change your perspective – in fact you should be certain your vision is clear. However, the shift in roles may require you to operate differently than you have in the past. The mission, and strategic and operational vision of your business are the foundational elements necessary for you to achieve success. Have them in place before you build your team and ensure that each team member is well versed in how you plan your business to run. Share your vision with your team members and hire personalities that will complement and strive to engage that plan and make it their own. Often the most difficult skills in the transition from agent to team leader is to learn to let go and delegate responsibilities. But in order for your team to embrace your vision, you have to show them that you believe in them. Carefully outline responsibilities and expectations around client services and then trust in the people and policies you’ve put in place to fulfill them. Once your expectations are communicated and team members have been trained, lead by example and coach team members only when necessary. Focus on positive reinforcement, rewarding good work with compensation and recognition. This will help build trust between the team and you and will demonstrate your commitment to a team structure. This commitment will serve as a key contributor to the long-term success of your business. Developing and maintaining clear and effective communication channels with your team, between team members, and with customers will help you showcase your commitment to the success of a team model. Share your vision, goals and processes with team members early in the relationship and lead by example, soliciting and exchanging feedback regularly. Host and attend sales meetings, as well as one-on-one and less formal gatherings. Your primary goal is not to be best friends with every team member. Rather, you should strive to serve as an example of how to communicate as a team, with your vision at the center of every interaction. Reward team members for assisting others on the team for the good of the business. To learn about how to lead a real estate team and achieve new levels of success in 2019, start your free 7-day trial of AgentEDU today and learn the skills needed to make the leap in the new year!